Rev. John Menaul (1834-1912), undated. Courtesy of the Menaul History Library of the Southwest. This was the reflection of the Revered John Menaul, a Presbyterian missionary, after five years of service in the New Mexico and Arizona Territories. A former missionary to Corisco, an island off the coast of West Africa, Menaul continued his missionary work on his return to the United States in 1870. His return came at an opportune time for the Presbyterian missionary enterprise. The post-Civil War years were significant in the expansion of U.S. settlements and Federal authority in the Western territories. And a recurring theme in this development were the questions surrounding the racially, culturally, and religiously diverse peoples who lived in these regions; as historian Steven Hahn notes “their place on the social and cultural landscape and their relation to the nation-state had to be reckoned with.” Missionaries were a key part in answer to these questions, being a vehicle for spreading “American civilisation” to these diverse peoples. “Not surprisingly, nation-states generally have great interest in education and other sorts of ‘missionizing’ activities…that aim at promoting new forms of character, participation, representation, market orientation, and faith,” as Hahn explains. However, the relationship between these missionizing groups and the nation-state was far from harmonious or complementary, and as Menaul’s complaint suggests, he was conflicted in his service to “two masters: the United States Government and the Kingdom of God.” Yet this conflict is suggestive of something even more significant. As historians Gregory P. Downs and Kate Masur explain in their recent work, the growth of the United States across the American West was not a cohesive, smooth process of "a consolidating liberal nation," but something more "illiberal and chaotic." Different groups and agencies, from railroad corporations and settlers to benevolent societies and religious institutions, advanced competing agendas and means to achieve them. These complex and competing agendas played out in the lives of missionaries such as John Menaul. Born in County Tyrone, Ireland, in December 1834, Menaul graduated from Princeton Seminary in 1867 and later received medical training at the University of Pennsylvania. After two years as a Presbyterian missionary in Corisco, under the Board of Foreign Missions of the Presbyterian Church in the U.S.A. (PCUSA), Menaul was dispatched to Fort Wingate, New Mexico Territory, as a missionary to the Navajo Indians, with the role of physician in the employment of the Federal Indian Agency for the Navajo Agency. John Menaul to John C. Lowrie, September 1, 1873. RG 224, Box 28, Folder 13, Letter 230. --Andrew Short is a PhD candidate at University College London. His research examines the domestic missionary enterprise of the PCUSA in the post-Civil War era. Along with colleagues at UCL, he blogs at The Young Americanists. 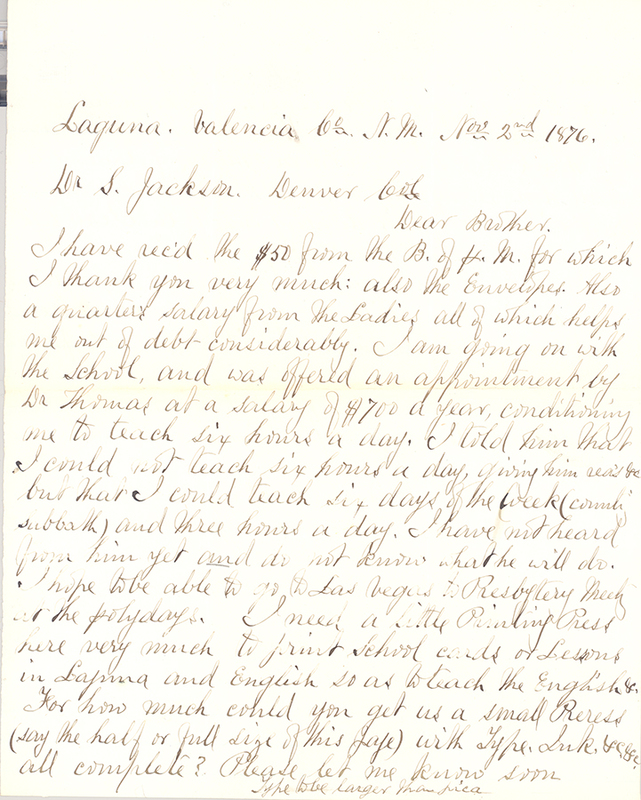 John Menaul to John C. Lowrie, July 31, 1875. 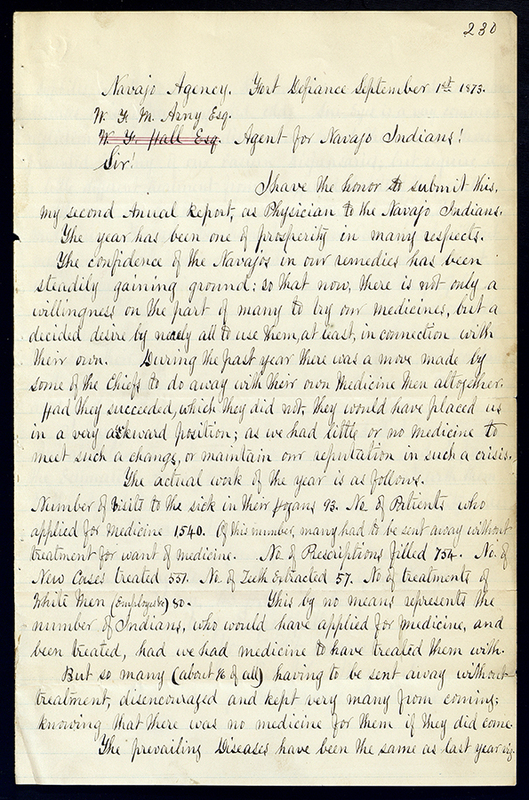 American Indian Correspondence: the Presbyterian Historical Society Collection of Missionaries' Letters, RG 224, Box 29, Folder 23, Letter 313. Presbyterian Historical Society, Philadelphia, Pennsylvania. Elliot West, "Reconstructing Race," The Western Historical Quarterly, 34:1 (Spring 2003): 6-26. Steven Hahn, "Slave Emancipation, Indian Peoples, and the Projects of a New American Nation-State," The Journal of the Civil War Era, 3:3 (2013): 319. Steven Hahn, A Nation without Borders: The United States and Its World in an Age of Civil Wars, 1830-1910 (New York: Viking, 2016), 400. Gregory P. Downs and Kate Masur, “Introduction: Echoes of War: Rethinking Post-Civil War Governance and Politics,” in The World the Civil War Made, Downs and Masur, eds., (Chapel Hill: University of North Carolina Press, 2015), 3. Necrological Reports and Annual Proceedings of the Alumni Association of Princeton Theological Seminary, Volume IV, 1910-1919, 165-166. See also, RG 414 Biographical Vertical Files, Presbyterian Historical Society, Philadelphia, Pennsylvania. Menaul to Lowrie, December 21, 1870. RG 224, Box 17, Folder 17, Letter 264. Menaul to Lowrie, October 31, 1870. RG 224, Box 17, Folder 14, Letter 219. Menaul to Lowrie, May 4, 1872. RG 224, Box 27, Folder 6, Letter 158. Menaul to Lowrie, March 18, 1874. RG 224, Box 29, Folder 7, Letter 68. Menaul to Lowrie, July 31, 1875. RG 224, Box 29, Folder 23, Letter 313.